Congratulations to Yale senior forward Matt Townsend for being named Rhodes Scholar this weekend. Townsend interviewed for the prestigious award in New York on Saturday and then notched 12 points on perfect 5-for-5 shooting in a win over Kent State on Sunday. Now that’s a productive weekend. 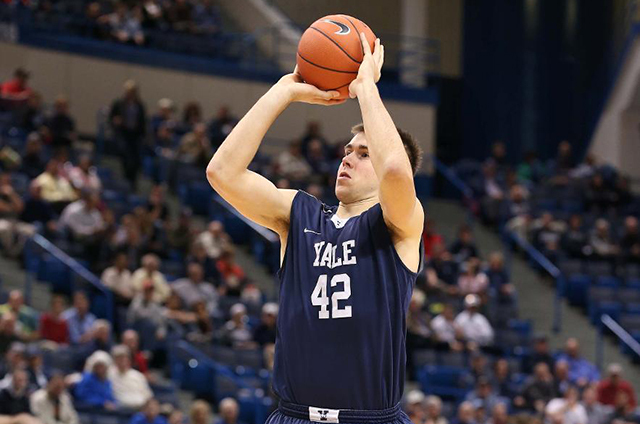 Townsend becomes the fourth Yale men’s basketball player to be named a Rhodes Scholar, joining Robert McCallum (1968), Mike Oristaglio (1974) and James McGuire (1976). Yale starting senior forward Matt Townsend will miss the next two games for a pretty good reason. Townsend will interview for the prestigious Rhodes Scholarship as one of eight Yale students selected as finalists for the award. Townsend, the first Yale basketball player since 1999 to earn Academic All-America honors, has maintained a 4.0 GPA average through six semesters at Yale as a molecular, cellular and developmental biology major. He’ll interview in New York this weekend and won’t play Friday against Illinois-Chicago or Saturday against Southern Illinois. According to the Associated Press, Townsend plans to rejoin the team for a Sunday game against Kent State. Townsend averaged 4.9 points and 3.2 rebounds per game last season. He would be the fourth Yale basketball player to earn a Rhodes Scholarship. In this era of academic cheating scandals throughout the NCAA, Townsend’s academic exploits are certainly refreshing. The Yale Bulldogs tipped off their season in Hamden last night, falling in a 88-85 double overtime shootout to the Quinnipiac Bobcats. Javier Duren came out firing. Yale’s starting point guard had 19 points at the half and finished with 26 points before fouling out in the first overtime. He calmly directed the offense all night, limiting his turnovers to just two, and shooting 50% (9-18) from the field. Jack Montague shot the ball with confidence and filled in admirably for the injured Nick Victor who is reportedly sidelined for 3-4 weeks. Montague figures to be first off the bench once Victor returns. His clutch three-point bomb at the end of the first overtime extended the game for the Bulldogs. Author Richard Kent, whose basketball work includes Big East Confidential and Lady Vols and UConn: The Greatest Rivalry, previews Yale’s season-opening Connecticut 6 Classic matchup with Quinnipiac, who the Bulldogs eliminated in last year’s CIT. There is a changing of the guard in the Ivies and nowhere is that more obvious than in New Haven. Yale has been picked by many to finish second only to Harvard by many preseason magazines. Over Princeton and Penn no less. James Jones, the dean of the Ivy coaches, is not surprised. He is a confident guy to begin with, also noting that “top to bottom [this is] the best the league has been in my tenure.” That says a lot, considering Jones has helmed the Bulldogs since 1999. Yale is coming off a loss in the finals of the CIT at Murray State. The Elis won 19 games in 2013-14 and if they take a page from Mercer, the CIT winner the year before, Yale could see NCAA action in March. Optimism abounds in New Haven as the Yale Bulldogs return most major pieces from a team that advanced all the way to the CollegeInsider.com Postseason Tournament (CIT) final last March. Let there be no mistake: led by Ivy League Player of the Year favorite Justin Sears, the 2014-15 Bulldogs have their best shot at an Ivy League title in the last decade. Despite the media’s unanimous crowning of the Bulldogs’ arch-nemesis up in Cambridge, Yale was voted second in the preseason poll and already proved last year that it can hang with the big boys in Lavietes, notching a dominant, league-rattling 74-67 victory over the Crimson in the midst of a seven-game winning streak that brought dreams of March glory to southern Connecticut. Coach James Jones has done a remarkable job of keeping Yale competitive consistently during every season he’s had at the helm, but he’s still looking for that elusive NCAA berth to hang his hat on. If it’s going to happen, it will probably be this year with his hard-working point guard Javier Duren in his senior season and the team building off the momentum of last year’s thrilling postseason run. After exploding in 2013-14, Justin Sears will get a lot of defensive attention this year, so it remains to be seen if the rest of the squad will be able to take advantage of their opportunities.